Columcille draws its inspiration from Iona - a tiny island of four-billion-year-old stone off Scotlandï¿¿s West Coast. The island has been a source of spiritual guidance and awakening for centuries. Written accounts of Iona as a place of pilgrimage date back to the seventh century and oral histories and legends preserve traditions that stretch back to the earliest times. Today, Iona is perhaps best known for the monastic community established by St. Columba (Colum Cille) and a group of twelve companions who sailed from Ireland in a small coracle in 563 AD. The monastery influenced the emerging spirituality of Celtic Christianity through its prayers, art and education, and missionary work. Its influence became so great that by the eighth century Iona was referred to as the "cradle of Christianity in the Western Highlands." But Iona has another, more ancient history as well. According to Hebridean legends and oral history, early Celts saw Iona as a ï¿¿thin placeï¿¿ where oneï¿¿s spirit could travel through the veils that separate the worlds. Early Ogham inscriptions call the island Iona after a moon goddess, or Hy Brassail -- a reference to the sacred isle of Tir Nan Og -- the Irish Other World. Some early maps list the island as Innis nan Druidnean, Isle of Druids, and show Iona covered with sacred oak groves. At one time, more than 350 standing stones marked sacred sites on Iona. The remains of many of these, some of which contain ancient carvings, can still be found today. For centuries pilgrims to Iona have been struck by the tiny island's lyric mysteries. "There are parts of the earth's surface," wrote one pilgrim, "where the spirit behind appearances seems to be closer, where a welling-up of power is felt, where the walls of the material are thinner." Iona is one of these places. Columcille is another. 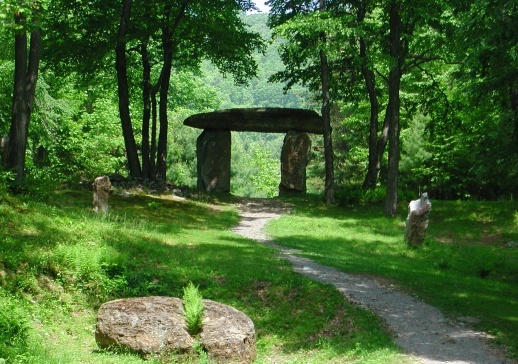 Rooted in the rich spiritual legacy of Iona and grounded in the four-billion-year-old stones of the Appalachians it, too, has become a place of pilgrimage where the veil is thin and myth and mystery are close at hand.